I already have DNS 12, but I’m looking for an OCR application to convert entire (including scanned) PDF articles to text (that would be OmniPage then), so I can import them into ConnectedText in one go and then delete the unnecessary bits, rather than continuing with my current piecemeal method of converting bits of text with the otherwise excellent ABBYY Screenshot Reader. After a bit more research I’ve decided to pay the extra couple of pounds and go for ABBYY FineReader 11 Pro. For one, it has generally better reviews than OmniPage 18, but also I’ve been so impressed with their Screenshot Reader – which I got for free and have been using for years – that I’m happy to reward them for that. Wow, OCR applications have moved on since the last time I used them a few years ago! So far I’m very pleased with ABBYY FineReader. It only took a couple of seconds to convert a 17-page PDF article to Word, complete with not only all the footnotes and headings but also all of the images. The main purpose of the scanning is to end up with a text version to be imported into ConnectedText. The scan wasn’t entirely perfect in the sense that the first page with the abstract ended up appended to the end of the Word document, but it was easy to fix that with a cut and paste job. There were a couple of italicised words in the original that weren’t kept in italics in the scan and some block quotes didn’t end up looking the way they were supposed to, however the OCR-ing, which matters to me the most, was very close to 100% accuracy. I have been a Dragon user (I’m talking about the speech recognition software) since version 9, although I have only started using it on a regular basis since version 11, as previously it was just far too temperamental. Version 11, and especially 11.5, on the other hand reached near perfection compared to what it had been before, with its 99% plus accuracy (as long as you used Dragon’s own DragonPad to dictate). Unfortunately it didn’t play nicely with ConnectedText, producing errors that made Dragon effectively unusable with CT.
Information on CT’s compatibility with DNS12 was nowhere to be found, so I took the plunge and bought the upgrade this morning. As I started installing it, there were a few hitches which almost made me regret my decision. First, InstallShield wasn’t able to close down one of the applications that it needed closed down: “Acresso software manager.” I tried to go into “msconfig” and shut it down, it still wouldn’t do so. In the end I tried to click “Help” on the “InstallShield” window to find a solution, which it somehow interpreted as “next” and carried on and installed the software anyway. After the installation I discovered that the problem apparently was caused by InstallShield itself, as the name of its company – and therefore of the software – changed from Acresso” to FLEXnet because of trademark infringement. So it was a weird loop caused by InstallShield not recognising itself, it seems. The second hitch was a cryptic message at one point in the installation process, which said something along the lines of “Dragon has installed C++, do you want to remove C++?” What?? Why are you asking me that for?? It would have been one thing to say one was an older version than the other and no longer needed, but there was no additional information whatsoever. I wonder how they expect average Joe Bloggs to know what that was all about. In the end I decided to keep C++. If Dragon had bothered to install it, I assume it knew what it was doing? Anyway, so far there haven’t been any adverse consequences of that decision. The third hitch presented itself during the upgrade tutorial. After a few screens Dragon just stopped recognising my input, suggesting that what I said was not recognisable or that my mic was not up to the task. I have a Plantronics headset that I bought specifically for Dragon a few years ago, and while this model is obsolete, it worked just fine with v. 11.5. “Here we go,” I thought, “I can start shopping for a new headset. So that’s why they gave me a Logitech 30% discount voucher at the checkout…” But, once I finished the tutorial and launched Dragon proper, my Plantronics mic worked perfectly again. All’s well that ends well… After the somewhat rocky installation Dragon ended up working like a dream. The touted 20% improvement in accuracy (which is already around 99%) was noticeable to me because there were only 1 or 2 corrections to be made where I would have had 5 or 6 mis-recognitions before. This is near perfection. However, the litmus test and indeed the whole rationale of the purchase was to see whether Dragon 12 would work with CT. I was pleasantly surprised. It’s not the perfect solution yet, but progress has been made. The perfect solution would be if I could just dictate straight into CT and it would work like it does in DragonPad. We’re not there yet. However, dictating into CT now triggers Dragon’s Dictation Box, which then pastes the contents directly into CT. See the two screenshots below for the Dictation Box and the results pasted in. This is an improvement, as it saves having to dictate into DragonPad and then do CTRL+A, CTRL+C, and CTRL+V, plus having to click in and out of windows to activate them, in order to copy and paste content (which I didn’t bother to do anyway). With the Dictation Box, it’s now down to one or two clicks. 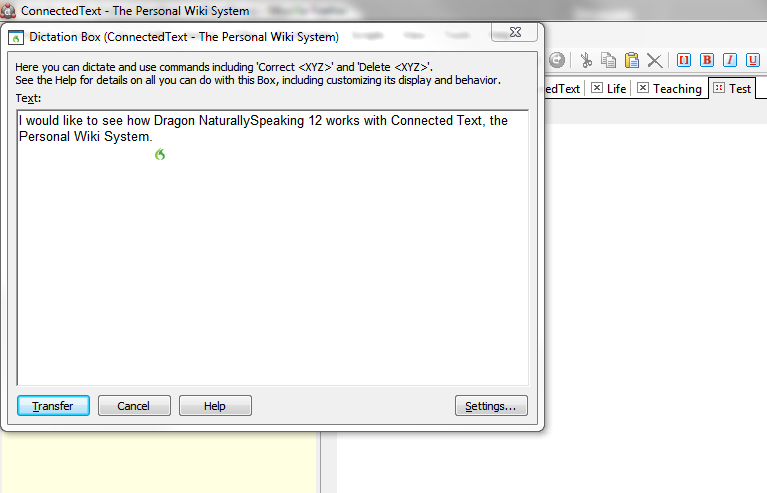 Just wake up Dragon (I assigned it to F1), and start talking, then click “transfer” and that’s it. I might start using Dragon with CT more frequently after all. Verdict: I’m happy with this purchase (minus the initial aggravation).